Each year, the anniversary brings back the memories, images, and sense of being unable to awaken from a horrifying nightmare. On that morning, I was in a room on the 28th floor of the Bonaventure Hotel in downtown Los Angeles. I hate high-rise buildings. I especially hate the Bonaventure because, in order to get to the upper levels, you have to ride in elevators that hang on the outside of the building. Tourists love to ride them up to the 35th floor to the rotating bar where you can look out over the city. I’m the one person facing the doors, my back to the windows, holding my breath, and praying for the elevator to get to my floor quickly so that I can get the hell out of it. I wasn’t supposed to be in Los Angeles that day. I was supposed to fly down the day before, argue a motion in federal court, and come back home that evening. But it was the boss’s last day on the job and she had a speaking engagement scheduled in downtown Los Angeles at 8:30 a.m. When she heard that I was also going to L.A., she asked if I would mind staying over to handle the speaking engagement, returning home on Tuesday morning, September 11. The only thing I was unhappy about was the fact that my hotel of choice had no rooms available so I was forced to stay at the Bonaventure — which had no rooms available on a lower floor. I distinctly remember waking up and turning on the Today Show, as is my custom, as I was booting up the laptop to read e-mails and newspapers online. That’s when Matt Lauer announced that a plane had hit the World Trade Center. I looked up to see footage of the first plane hitting the tower. During my first three trips to New York City, I stood outside the World Trade Center. I remember looking up . . . and up . . . and up . . . and thinking that I could not imagine being on the top floor. I recall being astonished that folks actually ran down all 105 floors following the 1993 bombing. As I stared at the television screen that mornning, my mind could not grasp what I was seeing. Those moments were for me, like the rest of the world, surreal. When it was reported that the highjacked planes had been destined for Los Angeles, I determined to get out of that hotel as quickly as possible. By the time I got out of the shower, all aircraft had been grounded. And as I waited in the garage lobby for the valet to bring my car around, I watched scenes from the Pentagon. I wondered whether to follow through with the speaking engagement. But given that no one had called to say it was canceled, I decided I had better go to the venue. We were all in a state of shock, walking around in a daze. People could talk about nothing but the morning’s events, but were valiantly trying to carry on with the day’s business, unsure of the extent of the catastrophe unfolding on the East Coast or how it would impact those of us 3,000 miles removed from it. I was the first speaker on the agenda, so I forged ahead with my presentation, wrapping up quickly. Then I apologized to the audience, telling them, “I would love to stay and participate in the rest of the program, but I need to figure out how I am going to get back to Lodi.” They would disperse in just a few moments, anyway: As I exited the building, I was met by members of the S.W.A.T. team who were evacuating all of downtown Los Angeles. Back in my rental car, I learned that all modes of public transportation were shut down. That left only one choice if I wanted to get home that day: Drive the rental car that I had picked up at the Burbank airport the previous day all the way back to Lodi. But the rental company representative was under a great deal of stress and did not think that was a great idea. He yelled at me, “You cannot take that car to Sacramento! You must return it to the Burbank airport today!” I was already heading north in Interstate 5 when I assured him that I would not be surrendering the vehicle. I didn’t care about anything except being in my own little house in my own little town with my arms around my kids. A couple of friends had been sent home from work so they called to offer me shelter at their homes until the airports reopened. “I appreciate the offer, but I just want to be in Lodi where nothing ever happens.” Ironically, Lodi would later make headlines when a couple of residents were accused of being associated with or training to be terrorists. I wasn’t supposed to drive that far. I was in the midst of treatment for a detached left retina. The first surgery had failed, causing me to undergo a second operation during which my eye was filled with silicone oil. I slept exclusively on my left side for nearly a year to cause the oil to rise and put pressure on the retina so that it would adhere and not slip off again. Looking at the world through the oil, rather than the eye’s natural vitreous humor, made everything appear distorted. Driving short distances was fine, but focusing on the road for more than six hours strained both of my eyes. The whole way, I listened to descriptions of the day’s events on the radio as friends, coworkers, et. al. checked in periodically via telephone. BigBob tried to convince me to pull over and rest my eyes. But I preferred to forge on. By the time I reached Lodi, I was exhausted and my eyes were throbbing. But I did just what I wanted to do: I went into my own little house in my own little town and the Siess gang had a big “group hug.” Like the rest of America, we spent the evening focusing on all the folks who did not make it home at the end of that day to hug their families. We are not the same nation we were before that morning. We are not as naively secure. We have been forever robbed of the sense of safety we used to take for granted. We are more vigilant, guarded. In New York City, security is forever heightened in all buildings, terminals, and on the streets. Police and security guards are everywhere, all the time, preventing you from sitting down to relax and “people-watch.” You must always keep moving. When I visited Ground Zero in March 2007, I was stunned to see how small the parcel of land upon which the World Trade Center stood is. The streets in Manhattan are narrow, the buildings close together, unlike here in California. It was a bustling construction site when I snapped this photo on March 26, 2007. This expansive list of names was mounted above the fence that surrounded the property. 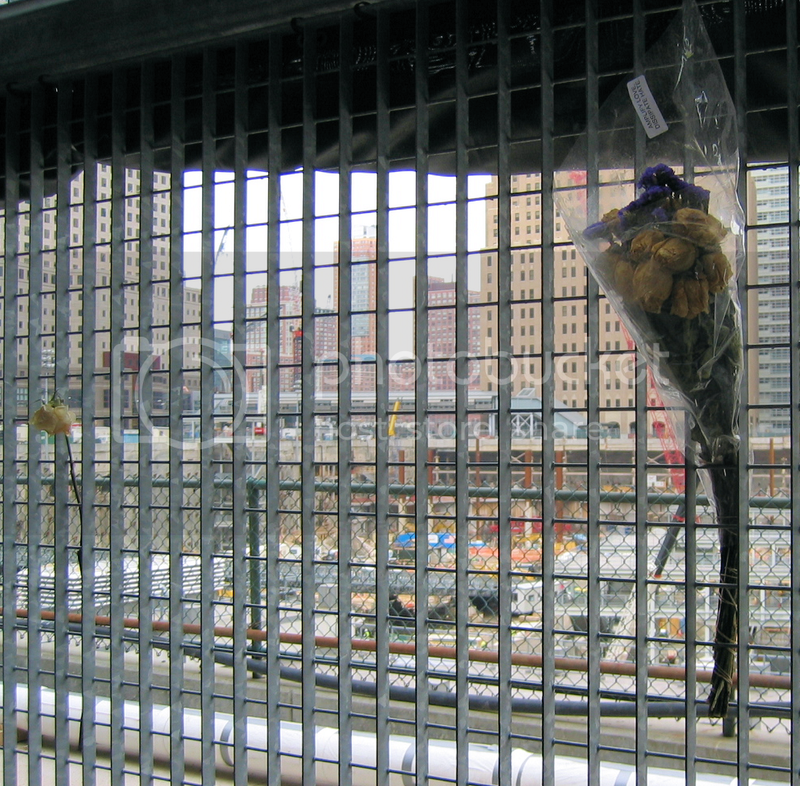 Flowers, pictures, stuffed animals, and other mementos stuff in the chain-link fence reminded visitors that the site is the only final resting place to which many families can go to honor loved ones whose remains were never recovered. All that remained of the original complex is the sculpture which stood in the plaza. When we visited, it stood in the park a couple of blocks away in silent tribute until construction on the memorial was completed. You cannot drive by a firehouse in New York City without seeing a plaque on the front of the building bearing the names and likenesses of those lost by that house. On September 11, 2001, all of our lives and the destinies of future generations of Americans were forever changed. That is why, on this and every September 11, we must remember and reflect upon our own experiences in addition to all who were lost in New York, the Pentagon, and on Flight 93 and those who mourn them. By remembering our own reactions and feelings, and sharing our experiences with our children and grandchildren, we are able to help them understand the magnitude of the tragedy. As a child, I used to tire of hearing my parents talk about the Depression and World War II. I remember thinking that I wished they would quit droning on about the events and circumstances they survived. But like all kids, as I matured, I came to appreciate, little by little, how profoundly their experiences shaped and informed their personalities, viewpoints, beliefs, reactions, and the manner in which they functioned. Many of the 9/11 survivors are suffering from mysterious respiratory ailments, while still more struggle to live with the memories of the sights and sounds to which they were exposed that day, their psyches and spirits permanently scarred. I don’t have any profound thoughts or words to add to the dialog about the events of that day. Like you, all I can do is share my experiences and photos, and my own belief that irrespective of where you were or how you experienced 9/11, as Americans, we must stand united by our memories, our prayers, and our resolve to remember and pay tribute on this and every subsequent anniversary. Unity is our best defense. I have tears dropping down my cheeks right now as I right this post. The loss incurred on 9/11 can never be forgotten. We all can just pray to god that he gives strength to the survivors. It brings an unknown fear when I read about 9/11 or think about 9/11. Are we safe anywhere in this world ?? This is so sad. I was in Italy when 9/11 went down. I really hope we get Bin Ladin. I lost my uncle in the towers and I will never forget September 11 as long as I live. Its hard to imagine that a human being is capable of such carnage. I was relatively young on September 11th. I remember the events that occurred, such as hearing about the attack and leaving school, but I do not remember my specific emotions or reactions to it. It was a day of great human loss,many lost their lives. We should pray that their souls may rest in peace. I remember it perfectly….I was in my room watching an animated flick….Don know which one, when during an advertisement, I saw the news….